Sell Your Classic Cord Today! 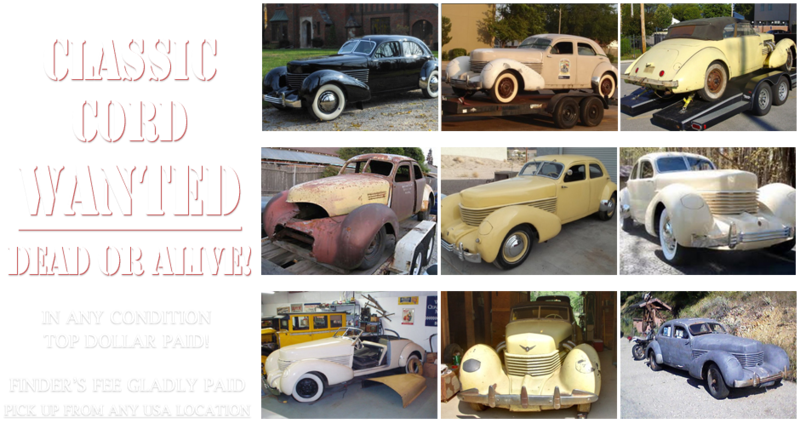 We are experts in the classic automobile marketplace and want to purchase your classic Cord automobile! Whether your car’s in mint condition, or was in a barn the last 30 years, we will buy your car today if it fits our collection of classic Cord automobiles. If you have a vintage Cord that you’re looking to sell, regardless of condition, PLEASE CALL US NOW AT 310-975-0272, or contact us via our website. At Beverly Hills Car Club we are happy to pay Top Dollar and in CASH for many types of Alfa Romeos: NEW, OLD, RESTORED, RESTORATION PROJECTS & EXOTIC cars. Are you looking to SELL your Classic Cord? Any year Cord: 812, Westchester, Beverly. Any Condition. And Tell Us About Your Classic Cord!